Chaiti Chhath or Chota Chhath is celebrated in the summer season (March-April), on Chaitra Shashthi, a few days after Holi festival. As the festival is celebrated in the month of “Chaitra” as per Hindu calendar, it is called Chaiti/ Chaitra Chhath. Just like the Kartik Chhath, this festival is also celebrated for four days including- Naha Khay, Kharna, Sanjhiya/ Sandhya Ghat and Bhorwa Ghat or Paran Chhath. The very first day of Chhath Puja is called Nahay Khay that literally means bath and eat. On this day, vratti or devotees take a holy dip or bath in the river Ganges and follow the path of self-resistance from the worldly things. On this day the women folks who observe the fast, take only one mean all through the day, mainly kaddu bhat with dal (only chana or mung dal). The meal is prepared only in soil or bronze utensils. The second day of the festival is called Kharna, Lohanda or Barauna. On this day female folks observe a fast for the day. In the evening, they prepare special Prasad kheer (cooked rice in jaggery or milk), puris and fruits. This Prasad is offered to the Chhathi Maiya and later the devotee breaks her fast by eating this Prasad. Later on, the Prasad is distributed among family and friends. The third day of Chhath Puja is called Sandhya Ghat (Evening Offering). The whole day goes in preparing delicacies and Prasad. The Vratti and family members wear new cloths and gather either at the banks of a river, pool or pond. They site there for one to two hours and worship Sun God, sing Chhath songs. Just after the sun sets, they offer evening arghya or Sandhya Arghya to perform the rituals of the day. On the last day (Paran Day) or Bhorwa Ghat (Morning Arghya) vratti again get ready and go to the banks of the river, pond and pool. The offerings are offered to the rising Sun. the Festival of Chhath ends this day. Vrattis after returning to home, break their fast by taking ginger and water followed by delicious food. 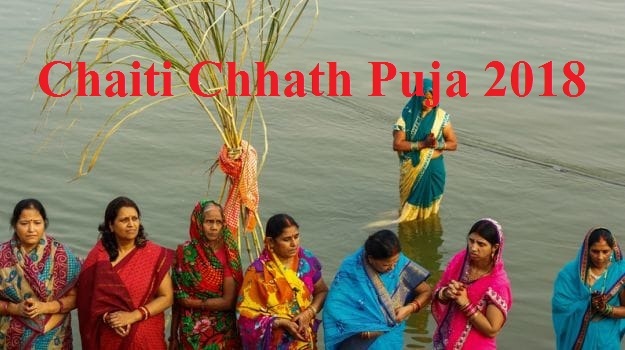 About Chhat Puja : Chhath is an ancient Hindu Vedic festival dedicated to the Hindu Sun God, Surya and Chhathi Maiya (ancient Vedic Goddess ; Usha - wife of Sun God ).The Chhath Puja is performed in order to thank Surya for sustaining life on earth and to request the granting of certain wishes. This festival is observed by Nepalese people and Indian people along with their diaspora.